As one of Sue Bryce's official mentors, Emily has been mentoring glamour photographers for the past year while simultaneously building a successful portrait business. For more details on booking a mentor session that is fully customized to address your specific hurdles, fill out the mentoring info request form by clicking the button below. 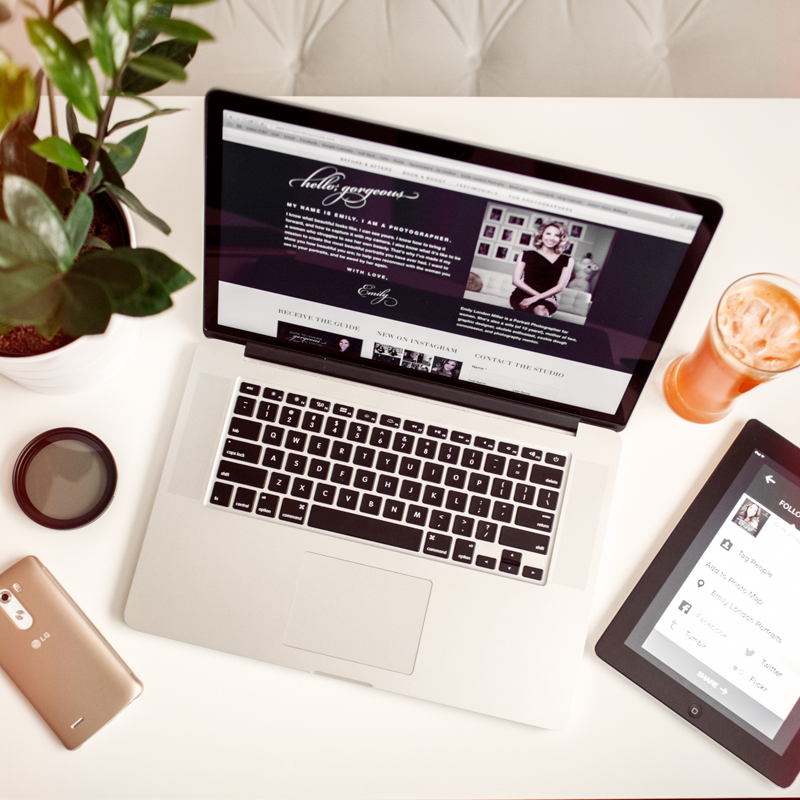 Want to educate your clients while delivering a beautiful and elegant introduction to your studio, setting the stage for the luxurious experience you offer? 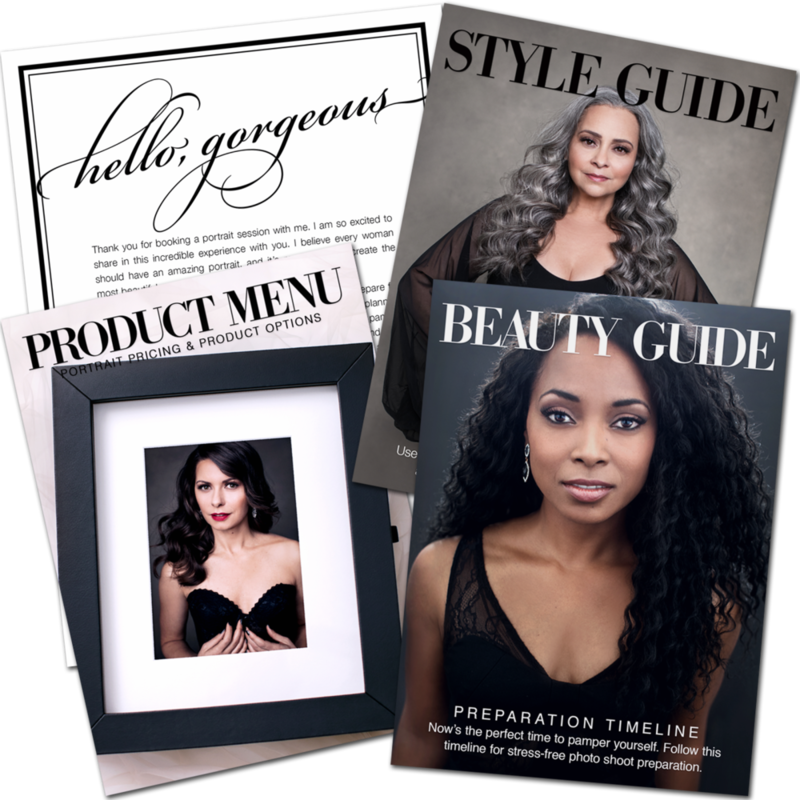 Check out my Glamour Guide Templates for Photographers in the Template Shop. I discovered Sue Bryce soon after I took up photography in May 2012. Enchanted by her modernized glamour photography and amazing teaching style, I bought her Glamour Photography Course and never looked back. I connected deeply with this new take on glamour portraits. I could do makeup. I could learn hair. Sue Bryce made everything look so easy, I was sure I could figure it all out eventually. So I gave five free makeover/photoshoots to friends, and afterwards I knew I had found my true love. I also realized that it was not at all as easy as it looked, and that I needed some major practice if I was going to become great at this. I offer three main products to my clients. They can choose to decorate their homes with a beautiful framed portrait, or a gorgeous framed wall gallery. For a special (and possibly private) option, the handmade Folio Box is an elegant keepsake designed to protect and showcase the images inside. For my photographer friends, this post shows the beautiful products I sell, and how they're packaged to deliver to my clients. A couple of months ago, it became apparent to me that I really need some help. There were certain tasks I dreaded doing for my business, and I was pretty much procrastinating other important things in order to avoid the stuff I wasn't especially keen on (answering phones, anyone?). When you're ready to hire employees for your studio, you'll want to read this post about how to find and interview amazing people, and how to streamline the process to be super quick and efficient. This is the second (and last) post in the series on Building a Makeup Artist Database. We've already learned how to find great makeup artists, and (I hope!) booked several test shoots. Now let's talk about how much to pay your artists, how to work well together, and how to keep the keepers.